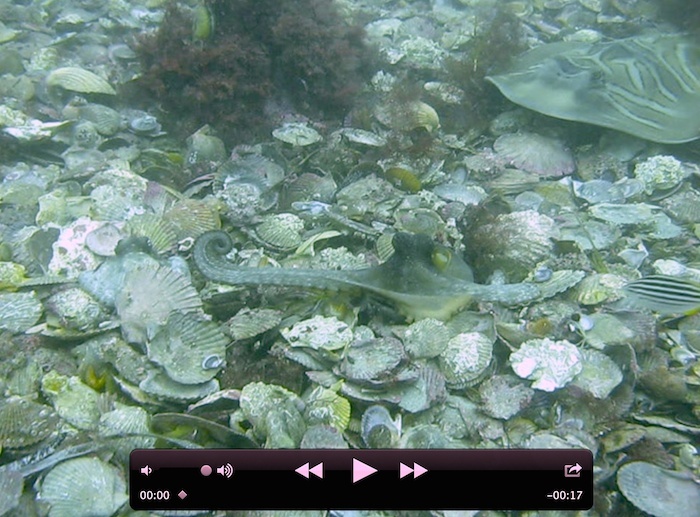 The photo (a video frame) shows one of the most vigorous fights between two octopuses I’ve seen. It was taken at Octopolis, a site at Jervis Bay, Australia, discovered by Matt Lawrence in 2009. We wrote a first report about the site in 2012. David Scheel then joined us, and we published a second paper about it last year. Together with Stefan Linquist, we all spent several days watching the animals at the end of last month. The aim of this trip was to improve our collection of video data about the site. 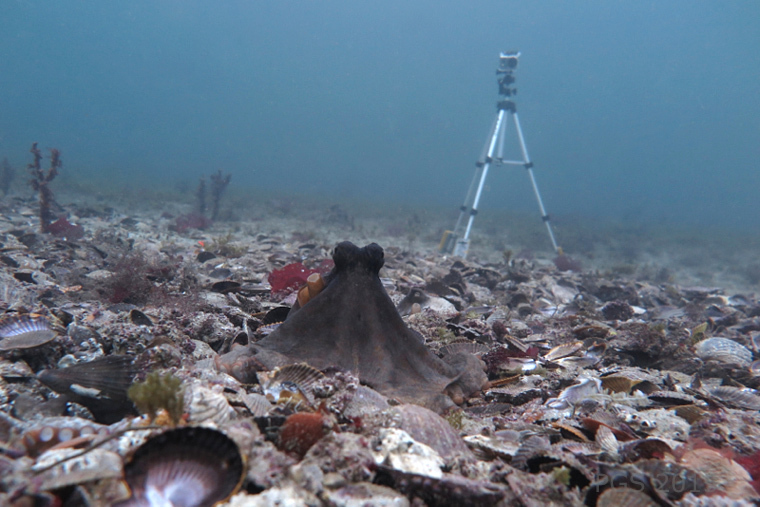 In the past we’ve often left a few GoPro cameras down there to film what the octopuses do when we’re not there. This time we had cameras going most of the time, during daylight hours, with some of them raised high on tripods. The all-seeing video coverage reminded me of Jeremy Bentham, the 18th century political philosopher, and his design for a high-surveillance building to be used in prisons, (and, among other places, POOR-HOUSES, HOSPITALS, MAD-HOUSES, AND SCHOOLS) called the panopticon. Bentham’s design has the watcher in the middle, not on the periphery, and unlike many of Bentham’s intended panopticon residents, our surveilled octopuses are free to come and go from the site. They tend to stay, though; one of the things that made last month’s trip a success was the large number of octopuses in residence (usually around 7) and almost ceaseless interaction among them, especially due to an unusually active and aggressive male, the right-hand individual in the first photo, who fought, mated, patrolled, and corralled his companions so vigorously that we wondered how he kept it all up. We haven’t gone through much of the video yet, but he seemed to rarely stop to rest or eat. The frame above shows him again on the right, and the video below shows him getting into two fights in the space of about 30 seconds (the second including the sequence from which the frame above was taken). These incidents are different from the one pictured at the top of the post. In the frame above he looks large in comparison to the other, but this is not an unusually large octopus for the site, and some of his adversaries looked about the same size. 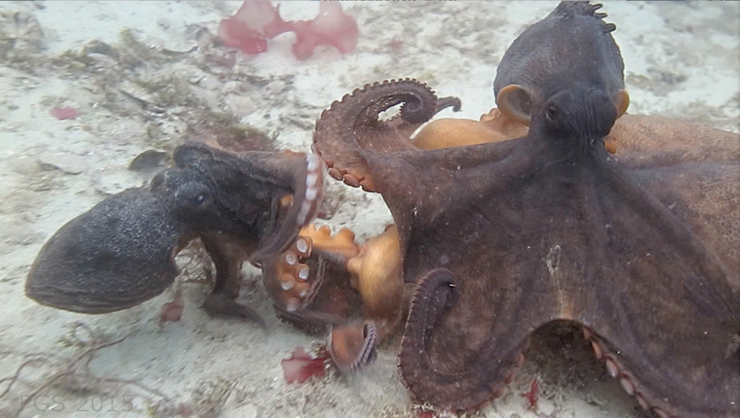 The second victim in the video below is one of the most beaten-up I’ve seen there, with several arms damaged either by other octopuses or one of the many predators our octopuses have to deal with. The fights are certainly dramatic, but some of the most interesting behaviors we see are non-aggressive – or at least much more restrained – ones. There is a lot of low-level jostling and jousting, and when one octopus passes another there is often an exchange of arm-pokes. 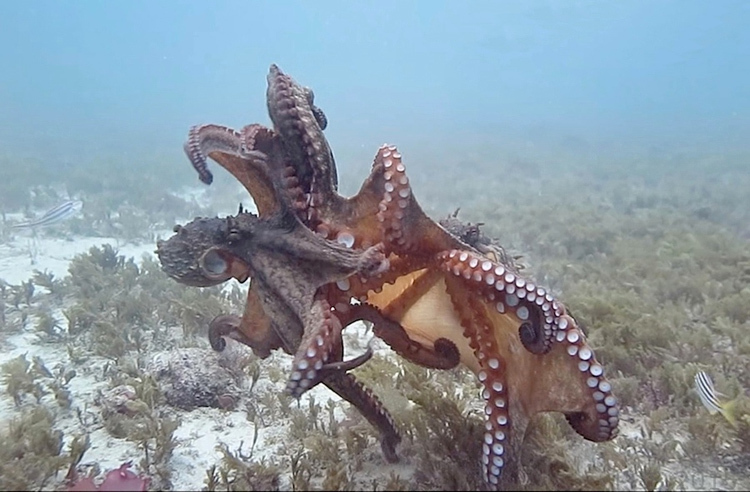 I have thought of these as “boxing,” but Stefan found himself calling them “high-fives” – the different terms have such different connotations for their role in octopus life. It might be that some are more in one category and some are in the other. This video (which does look like boxing) was included in the online supplement to our first paper about the site. Other arm-pokes do seem to have a different flavor, though. It’s another behavior we’ll have to analyze in detail when we go through the video and write it all up. Here’s a collage of photos of some of the vertebrates. 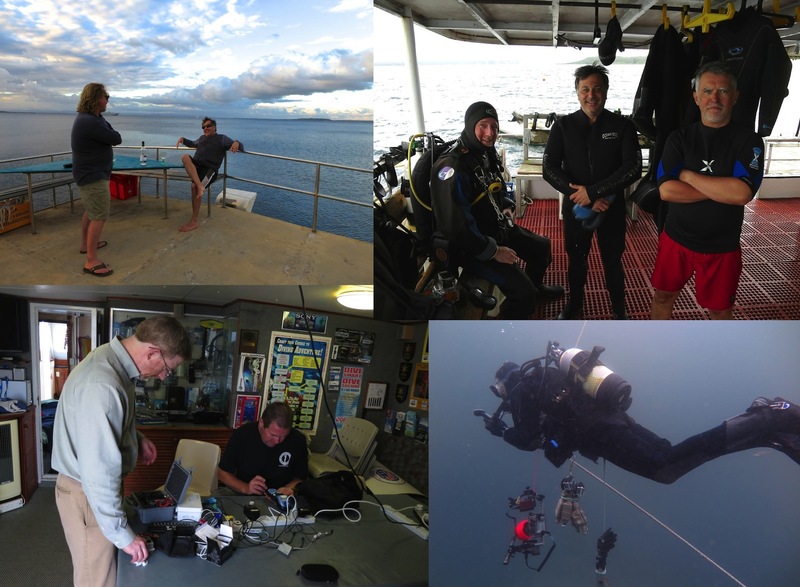 From top left clockwise: Steven Taylor and Stefan on deck, then David, Stefan, and me, then Matt carrying down gear, then Matt and David preparing cameras. Apparently the closest approximation to a prison built on Bentham’s panopticon plan is this one built in the 1920s in Cuba. Panoptes, I learn, was also a figure in Greek mythology, a giant with a hundred eyes. Thanks to Lyn and Mick, who own and operate Ocean Trek, for all their work in making the trip a success. This entry was posted in Octopus and tagged Octopus, social behavior. Bookmark the permalink. I wonder if the high five boxing has to do with individual recognition or sexual orientation determination. We do wonder whether some of the high-fives are used to recognize individuals as they pass. If so, perhaps there is a fairly definite distinction between recognitional actions and the low-level aggression or jostling that looks like boxing. The aggressive one in these shots is a male – we saw him mate with others as a male. We don’t know yet whether he’s only fighting other males. We hope to work that out.